A solar wind stream flowing from this minor coronal hole could reach Earth on or about March 23rd. Credit: SDO/AIA. THE SEASONS ARE CHANGING: Today, March 20th, is the date of the vernal equinox. At 7:21 pm EDT (2321 UT), the sun crosses the equator heading north. This marks the start of spring in the Northern Hemisphere and autumn in the Southern Hemisphere. Happy Equinox! "I've been planning this shot for a long time," says Paco Bellido of Cordoba, Spain. "Using Google Earth, I calculated the best place to set up my camera; then I followed my GPS to the spot. 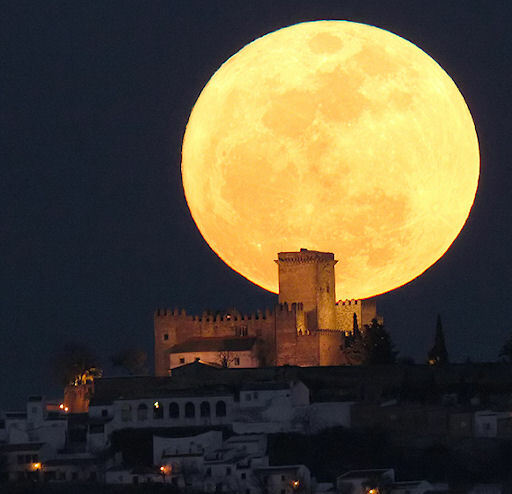 I waited for the Super Moon to rise and--voilá!--there it was behind Espejo's Castle." The eruption was not Earth-directed, but it did attract plenty of attention on our planet. Many amateur astronomers in Europe witnessed the blast and said it was the biggest one they'd ever seen. This event continues the recent trend of increasing solar activity, and shows anew that Solar Cycle 24 is gaining steam after a long period of relative quiet. On March 20, 2011 there were 1204 potentially hazardous asteroids.